The team of Farm Fresh Produce, very enthousiastic about their USA Sweet Potatoes. Also they served sweet potato beer. 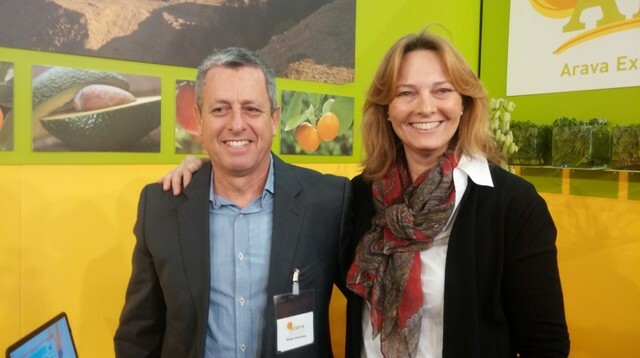 Avi Dagul from Field Produce Marketing, a date grower from Israel. They sell mainly Medjoul dates, as this variety is becoming more and more popular. From right to left: Dror Eigerman, Eldad Engelberg, Eitan Zvi, Yoav Nakash, Rafi Zuri, Ely Keslassy from Galil Export. An Israëli exporter of various fruit and vegetables. Deborah Meidan from StePac, part of the group DS Smith. They have packaging that extends shelf life and reduces waste. Miss France 2012 Delphine Wespiser is Miss Pinklady 2015. Pinklady introduced the new PinKids. A small bag with slices of Pinklady apple. Peter van Gilst from the CBI. This year they made different pavillions per country and they were in different halls. Marizel Aguirre, Teresa Baggarley and George Smith from Northwest Cherries, promoting the cherries. Emmanuel Descloux from Prince de Bretagne promtes the 'forgotten' vegetables. "Guy Milette from Courchesne Larose (Canada, Montréal) and Jean-Baptiste Pinel from Prim'Land both happy about the new Oscar logo and slogan: "Be Kiwi, Be Happy"
Nazir Mir, André Vink and Evan McCaskey of Agrofresh, they are introduce RipeLock quality system. It is a new technology to maintain the yellow color, freshness and the texture of bananas. Kenza OUALI (Responsable Marketing) with Amine Mamou, Deputy CEO (Directeur général adjoint) at Les Domaines Export (Morocco); Les Domaines is the commercial subsidiary responsible for worldwide marketing LES DOMAINES AGRICOLES’ fruits and vegetables. Our mission is to create value for our customers and producers by marketing quality products and offering the best service possible. Nic Jooste and Mario Goede from Coolfresh International introduce their new packaging and variety of the Bonsweet Diamanté pineapple. Aurélie Nunez from Regal’in presents the applet hat was nominated for the Fruit Logistica Innovation Awards. A cruncy sweet apple with a bit acid in it. Debbie Etsell from the B.C. Blueberry Council, she promotes the blueberries from Canada’s British Columbia all over the world. Yonit Sternberg and Ramie Hessel from Mehadrin, a big graower and exporter from Israel. Benoit Janny from Janny MT promote new transparent lids on their bins. It was upon request of the customer, that they could see the product, hat Janny MT made it. Jakub Gracz and Waldemar Sapata of Baltic Berry, Poland - Polish blueberry producer, exporter and importer. offers high quality fresh blueberry fruit from their own plantation and entrusted cooperating suppliers. All farms are GlobalGAP certified. Our facilities are now a modern ULO CA coldstore and packhouse, BRC certified. The provinces of the Alpes and Côte d'Azur joined forces in a pavillion. The Eiffel Tower in Berlin! Philibon wanted to give the feeling of an exotic former French island, from where they produce their fruit. Charles Henri Maille from Picvert, a French producer and importer of French salads. Aurélien Serrault of Le Jardin de Rabelais, based in the Loire Valley. They are a grower of premium French cherry tomatoes. Anne Florin from Saint Charles Export, represents a group of companies who are mainly focues on export and are based in Perpignan. Julien Battlle from Jardins du Rousillon, a specialist in stone fruit. Ross Wileman from Mission Produce, the market is more and more changing to Hass. The consumption seems to grow. T.J. Rogers and Ken Brunner from Chelan Fresh Marketing, grower and exporter from Washington apples. They see galas and fuji increasing. Now they are also busy with a new variety, which has no name yet, but known under CN121. It is a cross between a Honeycrisp and an unknown parent. At the Susta booth, Farm Fresh Produce treated the visitors with Sweet Potato beer! The USA Pavillion facilitated a meeting room or relax room. Juan Guzman from Bard Valley Medjool Date Growers, promotes the fresh dates from California. Although other countries around Europe grow the fruit as well, there is a demand for the Californian. David Anthony, Natalie King and Katrina Tonkogolosuk from Ruby Fresh. Last year the company increased their aril sales with 50%. Now their is interest in Europe as well, mainly some key cities like: Amsterdam, Berlin, Vienna. Jim Carr, Mark Erickson and Frank Sanchez from Blue Book Services an updated book for companies dealing with fresh produce in the North American market. Erin Wallich and Peter Simonsen from Summerland Varieties. They represnet varieties like the Ambrosia. Besides apples they represent 60% of cherries in the world. Athanasios Mandis and Adnan Sabehat from ZoePac. They have modified packaging which makes the fruit less sensitive for ethylene. Also they have now special bags for conumers, so they can put fruit in bags at home, to keep the furit longer fresh. Compagnie Fruitière made the booth inside with a nice hut where their staff could meet customers. Omer Kamp and Yair Ohana from Arava Export growers introduces sea weed. They received a lot of interest for this new product. Hubert Leclercq and Joseph Ben-Dor from Ben-Dor Fruits, toasting with red wine on their new red flesh line of peaches and nectarines. David Hai and Yacov Hason from David Hai Efi Shlao, an Israelie grower and exporter of dates. Gary Tozzo, Arthur Yusim and Erin Nadler from Mor International. Gary is from Mor USA, their sales office for North America. Gautier Seeds, a French seed breeder of vegetables and and fruit. Romy Gakh, Laura Spector and Avi Bar from Future Crops, they offer all technology to grow herbs in each country, without the need of a greenhouse. The winning team of BT9! Israeli peppers from Avi Kadan from Adafresh. He is still positive about the market. Eric Guasch from Comimpex and AFRAA is busy with Russia for the French fresh products. The goal is to open the market before August, but he is realistic however positive. Pomanjou International is very strong in the market with the Honeycrunch apple. Cédric Leite of Mouneyrac , located in Rungis, is only working with premium apples. They have now a new box (right of him), specially for far destinations. Cédric Vasseur from UnionPrimeurs promoting their wide assortment of fruit and vegetables. Nagesh Shetty and Nitin Sawant from Deccan Produce. The company exports grapes and pomegranates and is also looking to shipping potatoes and onions to Russia. MK Exports specialises in exotic fruit and vegetables from India. Pictured here with some of the products is Manoj Barai. These are some of the pomegranate packaging available from INI Farms, the newest addition to the range are the snack packs which come with a spoon and tissue, also new are the dual pack and the family pack. The team from INI Farms - Pankaj and Purnima Khandelwal, Kalpesh Khivasara and Ashvin Raghuvanshi. Maitreya is an Indian organisation of social entrepreneurs helping small farmers to reach international export markets. Kavita Kowshik and Meera Jamnagerwala are the founders of the organisation. Ashvina Trading co. export a large range of exotic fruit and vegetables from India, pictured here are Ashvina, Kirit and Riday Bhuptani. Janardhan Swahar from Y Cook was at the exhibition with some his products - sweetcorn, potatoes and cassava. These vegetables are specially packed using no preservatives and have a shelf-life of one year and require no cooling. On the South African stand - Anton Kruger, FPEF and Retha Louw from HortGro. Also part of the South African contingency was Jacques du Prez from HortGro. Jim Prevor - The Perishible Pundit with Emma Grant were part of the UK stand to promote the 2nd edition of The London Produce Show which will be held in June in central London. Mandy and Becky Hart were on hand at the Marco stand to advise visitors about the company's weighing systems. The company's newest development is a portable Fieldside Packing system, developed for companies who pack in the field with a battery life two days. The system is similar to other ones from Marco but is designed for companies who don't have packhouses. SRS Frigadon brought their chilling unit to Berlin, it is unique in that it uses natural refrigerants. Darren Powlett explains about the system. The team from SRS Frigadon - Johan Widing, Darren Powlett and Mark Varney. New from Herbert Engineering this year development of the Oculus sorter for use with citrus fruit which can pick out features on the skin which show the potential for mould in the fruit. Pictured are Mark Verschuren, Adrian Head and Glen Burt. Charlie Rich was on hand as usual at Tong Peal to tell visitors about the company's new control system for complete lines. The new system reduces Health and Safety problems as well as saving power. Ankit Bhargava AVI Global Plast with the range of Prime packaging for fresh fruit and vegetables. As the business grows new products are being developed the meet customer's demands. The company now does business in many countries around the world. Some of the punnets and packaging available from Avi Global Plast. Adele Ackermann - Capespan. The company recently opened a packing house in Istanbul, Turkey to pack Costa Rican pineapples and bananas. They are also investing in their own farms in South Africa. Some on the range on display at the Capespan stand. Bananas, pineapples and melons on the Fyffes stand. As always a very noticeable stand for Pink Lady. Chen Duan and Lisa Pang from China FVF taking in the Fruit Logistca experiance. Fraser Kelly and Karen Baker at Westfalia with the new 'Ripe and Ready' avocados. This big Jazz apple was finding it challenging to to make his way through the crowds on Wednesday! Haith Group came to Fruit Logistica to promote their new machine the 'Multi Wash'. It is a combination destoner,washing and polishing machine for root veg which is compact and self contained for easy installation and was launched in November last year. Pictured is Nigel Haith. Giles Brandon at the RedPack stand. Gerrit Tijhot - SisMatec, NL and Gary Wyatt - Proseal with the new GT5 packing/sealing machine from ProSeal, it can pack 30 - 210 packs per minute, it also has a fast tool change. The E-seal uses 7 tonnes of seal force and a continual feed system offers 25% increase in speed. Boosey Fruit Australia came to check out the event. Alan Pollard from PipFruit NZ was in Berlin to network and meet industry colleagues. EKM, Gogo were at Fruit Logistica for the first time this year, pictured here is Hank Coetzee. The Port of Antwerp had a stand at Fruit Logistica, present on the stand were many of the companies based in the port. Wim Dillen, Senior Business Development Manager at the port pictured here with Marc Rooms from Lancaster, explained that this year the Port of Antwerp saw an increase of 7.5% in reefer cargo last year. The Peel Ports were also at the exhibition for the first time. Peel Ports, Liverpool, UK is positioned in the north west of England a very central location in the UK. The port is under going a huge development program, the stage of which will be operational early and the port will be able to receive its first mega container ship later in 2015. Pictured her are Peter Faker, Katerina Schafer and Stuart Argo. Sirane were back at fruit Logistca with their Dry Fresh Soft Pad, an economical solution for maximum shelflife, the pad can give up to 5-6 days more for softfruit. Pictured are Gillian Carter and Adam Green. Ian Turner was present at the See Your Box stand. Gist made their first appearance as part of the UK Pavilion this year. Jacqueline Voss Wood, pictured here with Natalie Freeman, said the exhibition was a great chance to promote the their brand and meet clients, and potential clients from around the world. Gist brought some remote controlled truck along to attract the crowds. Jupiter Marketing also took the opportunity to promote their brand and network at the event. Jonathon Campaillo Knowles and Andrew Grantham were on hand for the photo. Jack and Jon Evans at the Muddy Boots stand. The company has recently integrated with GLOBALG.A.P. to make it easier than ever for customers to ensure that all products and suppliers comply with GLOBALG.A.P. Stuart Lane was at the Prophet once again to tell visitors about the company's software systems. Dry White joined the UK pavilion to promote their wash for fresh produce, James Blaxford was ready to receive visitors. The team from Sakata were in Berlin to promote the latest varieties. Andy Chamberlain, Dave Samuels, Kate Smart, Marjan Crvenkovski and Mehran Hojabr. A new extra sweet Piel de Sapo melon from Sakata. A few of the products at Sakata. The Bimi broccoli from Sakata, known in the UK as Tender Stem. JDM were in the UK pavilion with a few new products including a new 'Souper Booster' which can be added to many dishes such as wok vegetables to give a boost of floavour. Fern Varker, Darren Beven and Emma Smith. Stuart Booker from CHA has been working hard with the UK organisations to create and improve the UK pavilion. Colin Galbraith with Anna Boruch at Moorehouse & Mohan. Colin said there has been a rise in interest from Eastern European counties for UK potatoes as people demand a higher quality. Holfeld Plastics have won six prizes this year and were nominated for the Fruit Logistca innovation Award for their new packaging material shown here by Simon Dodd. Graham Bonus and Alasdair McLennan were visitors at the exhibition. David Rogers, UK sales Director at Tozer Seeds at the launch of the Flower Sprout to the European market. Marta Arroyo from Mint Global Marketing giving her presentation at the European launch of the Flower Sprout. Hennie van Es and Anneke Brittijn-Koekoek from total Produce. Products on display at the Total Produce stand. Easy peelers from Total Produce. More from the Total Produce range. Ready to eat mangoes from the Fruit for the Senses range. A big presence on the South African stand. Allan Simiyu with beans, avocados and mangoes from Kenya. Lian Jager and Simon Limmer- Zespri. Craig McBain and Arjan Verhagen from Halls. Andrew Patterson and his guest at the Mpact stand. Some of the cartons on display at Mpact. Rosstan Mazey at the Jazz apple stand. Laura McDonnell, Caroline Keeling and Margret Dineen at Keelings. Simon Hobbs, Dewey Scott, Stan Smith and Garry Smith from Scott Farms. Samuel Dennigan jnr from Sam Dennigan, as well as doing potatoes, the company is the also the agent for Green Giant in Ireland. Micheal Kennedy from K&K Produce a root veg supplier. Philip Meade Jnr, Eleanor Meade and Alex mcDonnell. Meades launched the first frozen chips made from Irish potatoes on to the Irish market last June. Nicholas Marsdon, Clair Barton, Jacqui Green and Colin Murray at Berry Gardens. The UK Pavilion, bigger and better than than last year, hosted a reception on Thursday. Sophie Lock and Robert Burns from the Potato Council. Stuart Booker CHA, Prof. Paul Berryman - UK trade and Investment and Nick Leake - Counsellor Head of EU & Economic Section, Embassy Berlin. Andrew Skea - Skea Organics and Ann Schemien. Linda Bloomfield, Briony Dunmore and Gill McShane. Rosie Watson-Armstrong and Fiona Applewhite from Angus Soft Fruits. Lochy Porter- Angus Soft Fruits and Peter Dunrose. Colin Galbraith - Moorhouse and Mohan and David Burnett - Hannon Transport. George Beach, Tommy Leighton, Jenny Kemp-Porter, John Valentine, Dominic Weaver and Marcos Alvair. Micheal Gobel - Hannon Logistics and Vincent Kroon - Eucon Transport. Myles Wynne, Harpreet Dhaliwal, Michael McKillop and David Morrow. The friendly bar staff at the UK Pavilion reception. Piet Schotel - CBI, Netherlands. Baltimore Innovations brought their new mini container with an absorbent pad sealed into the base to Fruit Logistica this year. Matthew Valentine explained that feedback from customers lead to this innovation as one of the biggest cost for them was the manpower to insert pads into containers. Soliman Masaoudi was at the Russel IPM stand to promote Ceranock and Zontrac, solutions to control fruit fly. Jon Clark from Total Cherry at the very busy Total Produce stand. Robert Cullum - Pacific Produce and Estuardo Masias -Prolan in the Peru stand. Pacific Produce imports Peruvian citrus, amongst other products, from Peru the citrus is grown by the Lacalera family, the biggest citrus grower in Peru. Nana Agyapong, Samuel Agyapong and Dr Bernard Nsiah on the Ghana Pavilion. Makhou Diop - EANGDS at the Senegal pavilion. Amadou Ndiaye Seck - ANS, Senegal. Mamour Gueye - Ngueya Sarl, Senegal. Amara Berte and Nanette Ackah - Bollore Africa Logistics, Senegal. Mary Maina - Notto, with vegetables from Kanya. This lovely lady was giving out leaflets for Polish company PSD in the new City Cube. Rakesh Anand at the Neeraj International stand. Emily - Fruit Group, Poland with her Mohammed. Bearta Katouwe and Pawel Jendrejczak - Agro Serw, Poland. Rafal Legucki - SunBerry, blueberry growers Poland. Cluadia - PDS Produce with Polish potatoes. Gosia at the FruVitaLand stand. Pawel Kwietniewski and Damien Gulewski from Green Logistics. The company has 52 ha of greenhouses in Poland which produce a wide range of tomato varieties. Eva Wozniak - GGP HandloSad. Agnieszka Tyminska from Hajduk, Polish mushroom growers. Radostan Bnojek and Piotr Porosa at GPW Bober. Robert Monarski from Alvena with Polish apples. Pawel, Joanna and Micheal at the InterTrade stand. Agniesika Zawadzka looking very cheerful at the MazaFruit stand. James Herne - DAI, Moldovia with Lukasz Mech - Windhunter Global Export, Poland. Mariusz Kedzia, Natalia Heyn and Mateusz Pilch at Limax. Agatha Malkiewicz - Polskie Jagody, blueberry and strawberry growers. The company recently introduced blueberry juice and fruit purées to their range. Blueberry Juice and fruit purée from Polskie Jagody. Rafael Zwoinski, Cezary Zwoinski and Michael Bulikowski - Frutco Fresh with naturally preserved fruit. The preserved fruit from Fructo Fresh is cut into pretty shapes. A range of the available fruit and packaging from Fructo Fresh. Robert Burns - Potato Council. Nagesh Shetty - Deccan Produce. Charlie Sneddon - CN Seeds. Beth Runciman and Edward Hale from CN Seeds. Banabay- (left to right) Yuchi Li, Alessia Pilade, Mark O'Sullivan, Briony Dunmore, Anna Viralainen, Vitali Donskoi. Director Jay Whang of SunForest (South Korea), one of the leading company in the field of non-destructive measurement of fruits’ maturity and sweetness, and has successfully supplied numerous installations of non-destructive sorting systems to various fruit farms. Agri Sciences - Turkey, a subsidiary of GMS Holdings, Jordan is at your service with its innovative solutions in the plant protection sector since January 2010. Solmaz Sin of Sin Gida- Turkey, founded as a family-owned company by Necdat and Nasreddin Sin brothers in 1989. Erol Topbas, Export Manager of Deka Plastik - Turkey, manufacturing plastic packaging materials for 20 years in Istanbul, Turkey.. specialized modified atmosphere bags for fresh produce. Ms. Lydia of Simo Natur (Barcelona, Spain) with Aziz Abdou Simo of ABAZ (Morocco), Moroccan producer and exporter company of fresh fruits since 1986 specialized in avocados, mangoes, blueberries and is developing new products to be marketed shortly. at the Zeus (Greece) stand: Antonios Ioannidis (Sales Manager) with Christina Manossis (General Manager) Zeus - Greece with Joy and George Kroussaniotakis of Zeus-UK; commenced its activities with the cultivation, production, standardisation, packing and trading of kiwi. Vickie with little sister Anna of Xiamen Bona (China), recognized around China as a professional fresh fruit and vegetable supplier. Products include honey pomelo, mandarin, tangerine, navel orange and fresh carrots. Vice President Hakan Nikbay of Ay Kasa Polimer (Turkey), provides foldable plastic boxes for food logistics, food packaging and non-food / houseware. The Agronom Berries (Poland) team: Kristofer Sak, Pawel Zarzycki and Pawel Dabrowski... situated in eastern Poland, Lublin Province. Own and operate cold storage, special crop equipment and essential supply base and it guarantees best quality. Panagiotis Antonakis of Greek Onions (Greece), produce, store and market onions all year round.. production begins, each year around the beginning of May. Marketing Specialist Hady Selim of AGreen (Egypt), AGREEN is one of El Banna Group which is considered to be the biggest grower of oranges in the Middle East; owns 3000 hectares of orange in Wadi El Molak as well as 9000 hectares in the Wadi El Notron area. Chairman Mohamed Eldosouky with son Ayman of EGCT (Egypt) and Key Account Manager Hisham El Khadem of Safmarine (Egypt), one of the well-known and reputed Egyptian fresh fruits and vegetables producer and exporter. Export Director Magdi Abdel Messih with the grandchildren of CEO Hesham El Naggar: Mostafa, Marian and Mahmoud of Daltex (Egypt), Daltex is the principal exporter of the Egyptian fresh produce for the fruits and vegetables for more than 50 years. Supply Chain Manager Samer Dawoud of Sonac (Egypt), exporting around 40000 tons of citrus (table & juicing), 50000 tons of potatoes (table & processing) and 12000 tons of frozen fruit & vegetables. Logistics Executive Mohamed Azmy with Commercial Accountant Ramadan Kader of Blue Nile (Egypt), main market is UK since 1988 .. the company policy has always been to respond and adapt to customers' needs and changing requirements. Managing Director Sherif Taher with Export Manager Muhammad Abdul Qader of Taher Trade (Egypt), the company was established in 1989, and has been doing business ever since, which gives us over 23 years of experience in trading and importing in the field of animal feed products, and in exporting all types of fruits and vegetables grown in Egypt whether fresh or frozen. The Royal For International Trade (Egypt) ladies: Henna, Noha and Heba, the company is the newest addition to the growing portfolio of El Adawy Group; a long standing family business for more than 3 decades found in Egypt. Ms. Rana of Fresh Plus (Egypt), main products are citrus, grapes, melons and onions. Amr of Belco (Egypt), exporting top quality table grapes to Germany, and then new markets were developed, such as the United Kingdom, Holland, Italy, Switzerland and France. Managing Director Ahmed Abdelhady of El-Shark (Egypt), company runs three product lines to cover all the different products such as navel, valencia, industrial oranges, mandarin, lemon, Grapes, pomegranates and grapefruit. Export Manager Nehad Abdelaziz of Ragab Farms (Egypt), their mission is to deliver the utmost quality fresh agricultural products by adhering to five core values: innovation, quality control, food safety, customer-orientation and social responsibility. Salfa Khalifa (Sales Specialist) of Hama for Food Industries, Egypt - company’s production line is equipped with the latest technology and it is 100% automatic line with minimum human interference in all stages from receiving the raw material, inspection till packing. Kotzakolios, general manager at Asepop Velventos(Greece). ASEPOP implements a total quality production system and is certified according to ISO, HACCP, GLOBALGAP and EUREPGAP. QA Manager Manolis Anastasiadis with Owner Nikos Protofanousis of PROTO (Greece), the company is one of the largest exporters in Greece, with an annual turnover of 23 million euros. the Market Vertrieb ladies (Germany): Virginia Dominguez, Iman and Sonja Lucker .. the company is a partner of FRESOUER, a unit of production and export of fresh and frozen strawberries. Sales and Marketing Director Ms. Fatiha Charrat(r) of Delassus (Morocco) with her team; Delassus has been in the business for over 60 years already specializing citrus, cherry tomatoes, grapes and flowers. Walid Gaddas of ALYSSA FRUITS (Tunisia), he belives that there are more opportunities in Europe this year.. their delivery times vary from 2 days (Italy, South of France) to 4 days (Northern Europe). Catherine Shao (sales dept.) of Land Produce - China, products are garlic, ginger, apple, pomelo, chestnut,carrot,shallot, onion, broccoli, cauliflower, snow pea, pear, orange and many more. Sales Manager Sunny Chan of Xiamen Sonpy Import and Export; Sonpy has 20 years experience in planting and processing pomelo with 210 acres honey pomelo orchards passing Global GAP certification and guarantee excellent quality products through implementing of strict QC system. Sales Executive Tony Zhao of Trans-High; export volume is around 18 Million US Dollars. Built a top grade automatic controlled coldstore with their UAE partner: Shandong Suneast Foodstuff Co.,Ltd where the total investment was RMB40 million. Each year, it stores and prosesses garlic for more than 30000 tons. Amy Zhang of Jining Fuyuan Fruits and Vegetables (China), products are exported to America, Europe, Africa, and Asia. Main products are apple, pear, ginger and garlic. Chairman Jun Zhang of Just Green Agricultural Produce Development (China), offers fresh and processed fruits to America, Africa, Asia, East Europe, Middle East and North Europe such as strawberries, beans, etc. General Manager Mark Cen of Chaoyang Plastic Products Factory(China), established in 1997, the company is a professional corporation manufacturing and exporting various agriculture packing products such as raschel bags, bale net wraps, raschel bags on rolls, pallet net wraps and other related products. Chris Kim of Quali Korea (Korea), one of the leading suppliers of fresh mushroom from Korea.. offers a wide variety of mushrooms such as King Oyster, enoki and shimeji. Vladimir Kostandinovic of Krusik(Macedonia); founded in 2006 and has a 22 HA orchard growing pear, apple and plums. In 2002, Krusik began storing fruits in its own ULO Cooling storage with a capacaity of 600 tons. Ms. Natalia Pawlicka with Adrian Kwiecinski of Silvan Logistics (Poland), specialize in distributing food products in refrigerated trucks in controlled temperatures as well as in transporting industrial articles by tarpaulin trailers in Poland and throughout the European Union and Eastern European countries. Import Manager Ramin Musayec with Iehom Hajyex, Head of Sales .. main activities of Akhmed Fruit Co. are: import, storage (posses total approx. 15 000 sq. meters of cold stores in St-Petersburg) and sales of fresh fruit and vegetables. GLOBUS GROUP was established in 1993 and has more than 22 years of successful experience in import of fresh fruit and vegetables. Liana Efendieva with the president of the St. Petersburg department, the company is a St. Petersburg-based importer and distributor of fresh produce throughout the Russian Federation.